You can install TypeScript on your build server. The big problem with this solution is that it means you have to install a specific version of TypeScript on your build server, and thus make all of your project depend on that single version. You can check the TypeScript compiler into Source Control. Create a TypeScript folder in the root of your solution folder. 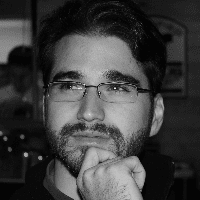 Create a SDKs folder inside of the TypeScript folder. 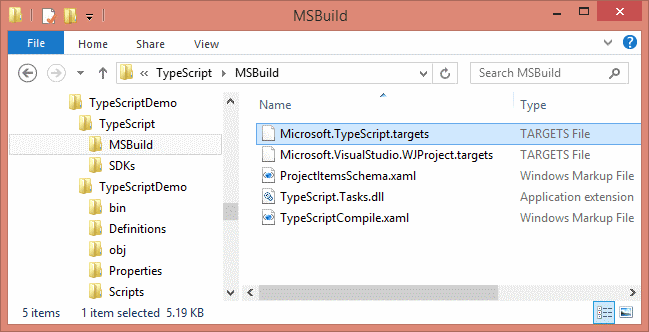 Create a MSBuild folder inside of the TypeScript folder. Copy the contents of your TypeScript SDKs install (where the TypeScript compiler, tsc.exe, is located) to the TypeScript\SDKs folder that you have created. Copy the contents of your TypeScript MSBuild folder (where your TypeScript target files are located) to the TypeScript\MSBuild folder that you have created. Edit TypeScripts\MSBuild\Microsoft.TypeScript.targets to make the TscToolPath point to your local SDKs folder. Open your project file for editing. Update your TypeScript project import to follow a relative path to the local folder. You're done! Reload your project and test it out; if that works, check it in. One possible simplification to the process is around step 6, modifying the .targets file. Don't set the TscToolPath here, but instead do it in the .csproj file in step 8, and include a new PropertyGroup with a single TscToolPath element. The .targets file only sets TscToolPath if it's currently unset, so setting it in the CSPROJ file means that, when you come to upgrade the compiler version, you shouldn't have as many edits to do. I also had to add the tag TypeScriptToolsVersion in my csproj. Otherwise the hosted build controller on visual studio online complained about a wrong TypeScript compiler. My next post will be about using TypeScript with the BundleTransformer, so stay tuned! How to Start Using TypeScript Today!